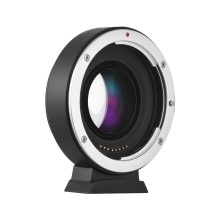 Viltrox EF-FX2 lens mount adapter is suitable for Canon EF series lenses to be perfectly mounted for Fuji X-mount mirrorless cameras. Reduced imaging focal length. Focal length is multiplied by 0.71X based on the original(equivalent focal length=focal length×0.71), which helps enlarge 1 level aperture. Zinc alloy technology, stable and reliable. It is also built in 4 groups, 4pcs optical glasses. By adapter mounting it can achieve functions of EXIF signal transmission, AF(auto focusing function) and adjustable aperture, etc. Signal transmission using PIN gold needle, greatly enhance its transmission performance. Firmware upgrade is via. the USB port. 1/4inch screw hole at its bottom, which can be easily installed on a tripod or other fixed bracket.